Greg R. Fishbone is the author of books for children, teens, and penguins of all ages including THE PENGUINS OF DOOM--available now in bookstores and online! A lawyer by day and writer by night, Greg fights a never-ending battle for truth, justice, and fun. He lives in the Boston area with his wife, baby, and two cats of varying temperament. The new blog is up at http://gfishbone.wordpress.com with a number of new posts. Your comments are hereby solicited. Thanks, LiveJournal, for a bunch of good years! I'm in the process of rebooting my blog. I'll have news very soon and a dramatic reveal of "Project G". I saw this object on the shelf at my local Borders and it melted my mind. But as intriguing as a "Star Trek" themed online book would be, this product that claimed to be a Star Trek online book appeared to be nothing more than an ordinary ink-on-woodpulp paperback. There was no USB port embedded in the spine. The pages weren't updated through a wireless interface. This purportedly online book didn't even have a touchscreen. As it turned out, The Needs of the Many wasn't the "Star Trek" themed online book I'd expected. It was instead a "Star Trek Online" themed book--a traditional book based on an online video game based on a television/movie franchise. What a way to milk a story universe! So okay, false alarm. This book turned out to be a sad little novelization of something online that exists entirely outside of the book's pages. But I'd like to see a product that starts as an ordinary storybook which then expands, updates, and customizes itself through a network connection. It wouldn't be the digitized version of a traditional book or a video game in text-adventure format--it would be a self-contained product capable of evolving into new configurations based on the needs and preferences of each reader. Now that what would really fit The Needs of the Many! I've blogged before about Project G, a promising work-in-progress that's gotten perhaps a bit too complex and complicated over the past few years of revision. As an author, I love the challenge of coordinating events in seven time zones and across the Solar System. But as a reader, I'd probably be hopelessly lost without the benefit of consulting my timeline and author notes. That's all changed with the new "streamlined" version of Project G. Events in China, Germany, Brazil, and Mexico now happen off-stage and behind the scenes. There are fewer viewpoint characters to keep track of. The book moves faster and there's more room for deeper development. I still have an epic story to tell, but this part of it no longer feels like the opening book of an epic series. Also, I'm no longer pitching it as a series. This book will stand alone with an opening for potential sequels. Mind-blowing epic sequels, muhahaha! I've been thinking about The Phantom Menace as a model. The movie had some truly irredeemable aspects but many critics piled on because Menace wasn't the galaxy-spanning epic film they were expecting from the Star Wars franchise. That never seemed fair to me. Menace is structured as the first movie in a six-movie series, the one that introduces the key players and kicks off the action, and it does that very well. When we first see Yoda, for example, he is at the height of his powers, ruling an invincible Jedi Counsel from the political center of the galaxy. Seeing this aspect of Yoda makes it that much more impactful when he's reintroduced as a fugitive, hiding from the Empire in a swampy unpopulated wilderness. We have a few hints in Menace that there's a dark side to Anakin, but his development into villain of Darth Vader's stature is meant to be a surprise. Having a believable Anakin-to-Vader arc would, theoretically, give us a better feel for the villain's motivations and a bigger context to his ultimate redemption. The subsequent lack of a deep or believable path of the character's development is a shame, but I can't fault Menace for how badly Anakin's character arc is mangled in Attack of the Clones and Revenge of the Sith. Menace would have been a huge critical success if it had been released in 1977. For one thing, a non-CGI Jar-Jar would have had been a hundred times more watchable, but also the film wouldn't have been burdened with many years of anticipatory buildup after the grand climax in Return of the Jedi. As a small movie, Menace makes a big statement: the corruption of the Galactic Senate, the establishment of an Imperial dictatorship, and the end of the Jedi order all have their roots in a seemingly insignificant trade dispute on a single backwater world. So that's my model, with Earth being the single backwater world and a game of Tic-Tac-Toe instead of a trade dispute. Of course my story won't have any Gungans in it. And no midichlorians. And I'm trying my best to avoid plot holes and bad dialogue. And now that I think of it, maybe The Phantom Menace isn't the best model to work from after all. I have to delurk for a moment to say goodbye to Newbery Medalist Sid Fleischman, who died last week after celebrating his 90th birthday. I first met Sid at the SCBWI annual conference in Los Angeles in 2004, and had the honor of introducing him at his workshop on screenwriting. Sid's workshop was both informative and entertaining, but my duties of shepherding him to the event nearly had me in an apoplectic fit. The light over Sid's podium blew out just before he was to speak, requiring me to frantically search for a maintenance staffer while Sid peered at his notes in the darkness. Then there were technical difficulties with the sound system and podium itself, but Sid was amazingly good-humored and patient with the delay. Finally, when came time for me to introduce him, I asked if Sid wanted me to read from the biography in the conference materials. He looked at them and said, "No, this is all about my career as a book writer. Since this is a workshop about screenwriting, it should be more about what I've done in that field." So we sat down for five minutes and wrote a whole new bio, from scratch, about Sid's equally impressive work for film--and five minutes was hardly enough time to cover half of it. After the workshop we went to the conference luncheon, where I discovered that SCBWI's new award for humor writing would be called the Sid Fleischman Humor Award. Sid was a speaker at the SCBWI New England Conference in 2007, where he inspired us with his words and wowed us with his stage magic. I gave him an ARC of my book and one of the biggest thrills of my life was hearing from him that he enjoyed it and thought it was very funny. Sid will be missed, but his talent lives on through his books and films. The Ghost in the Midday Sun continues to be the best pirate book I've ever read and The Whipping Boy defines the entire genre of stories about whipping boys. Does anyone else remember "The Bloodhound Gang" segment from 3-2-1 Contact on PBS? It blew my mind to learn that Sid wrote that as well! Sid also has a biography of Charlie Chaplin coming out in April 2010 from Greenwillow and at least one other posthumous book that I know of. Sid Fleischman was my idol. I'm still in shock at his loss. You know that I could [squeaking sound] some bad [constipation sound]. Nah, I kid. I'm sure it's a lovely song if you can stand to listen to it all the way through. To anyone who's noticed my recent lack of posts and cared to know why, there's been nothing to blog about on the writing front during the summer semester of my Masters in Teaching program, and little Internet connectivity during my subsequent period of rest and recovery at the Jersey shore. The projects I put "out there" in the spring have fizzed from editorial indifference and my agent is on me to put something else in the hopper. That's what August is for: I've promised to have something new and fantastic by the end of the month. Every author should have a folder or directory called "shoebox" where partially-finished books can sit and simmer. Every author should also have at least one project that can be referred to as "The Work." This is a book or series that's so ambitious, revolutionary, complex, original, and/or research-intensive that it can't possibly be finished...yet. The third thing every author should do is aim for continual improvement in the art and craft of writing. The moment you think of yourself as a "good enough writer" is the moment you start losing your edge. Instead, if you're comfortable with the self image of a "continually improving writer," you will be able to go on to ever more challenging projects that require a higher and higher level of skill. Years ago I poured a huge amount of time and effort into a certain project. It had an epic plot, innovative story world, and original narrative voice combined with elements I'd never seen in any other book. The early manuscript was a hit among test-readers including my then-girlfriend, who is now my wife (I'm not claiming she married me because of this book, but it certainly didn't hurt). This was "The Work." I took this project as far as I could go with it, and then as far as my critique group could push me, and I still didn't have the skills to write this particular book to the level I thought it deserved. So I put it into the shoebox for what I intended to be just a little while. That was in 2003. For the last six years, I have worked on other projects--including The Penguins of Doom (Blooming Tree Press, 2007)--always refining my skills in the process. I have also picked up tips and tricks from other authors through their books, blogs, and conference workshop presentations. And you can't discount the bits and pieces picked up from six years of life experience that include getting married, being published, hanging with the Class of 2k7, becoming a father, and switching careers from law to education. When I dug into the shoebox last week and opened "The Work.doc" for the first time since 2003, I saw the story with the eyes of a continually improving writer. I could identify flaws in the story, places where the manuscript fell short of my original vision, and--this is the exciting part--I could now figure out ways to address those issues. By the end of August I will have a hugely-improved version of The Work to present as "something new and fantastic, just as I promised." I'm confident it will be good enough to submit, although out of my hands as to whether other people will take a chance on its publication. If there's no interest, the story will go back into the shoebox until I am able to bring it to an even higher level. In the meantime, I wanted to write this post to encourage anybody who feels frustrated with the gap between their grand vision of "The Work" and the rough manuscript that represents their current level of writing. Don't get discouraged. Put that manuscript into an electronic or paper file, move on to other things, and continue to sharpen your skills. There will come a time in some months or years when you will be able to close that gap. And as a bonus, when you're looking for something new and fantastic to submit, you won't have to start from scratch. Today's word of the day is "Grad School" because I'm going back for a master's in teaching, starting next week. You may notice fewer posts from me about writing, but you will now find posts about teaching on my new teaching blog. So, how long exactly until I'm allowed to stop shaving? Today's word of the day is gods. With a small "g". It's been a while since I put a post up on "The Spectacle", the speculative fiction group blog I share with fellow authors Parker Peevyhouse, P.J. Hoover, Jo Whittemore, Linda Joy Singleton, Joni Sensel, and Steve Brezenoff. My current entry is some thoughts on gods and their use in fantasy. My experience is that pantheons of gods seem to be showing up in more than ever in literature including contemporary fantasies where you wouldn't expect to see so much mythology. There are two individuals I blame for this, only partially tongue in cheek: Edith Hamilton and Gary Gygax. Today's word of the day is Conference. Years ago, I got some advice that went something like this: "If you want to write for children, you have to join the Society of Children's Book Writers and Illustrators. Attend the conferences. Meet people. Network. Get involved. Get informed. Get inspired. Volunteer. GIve back. But don't ever, ever, ever volunteer to run a conference because that's a year of your life you'll never get back." I've followed that advice well enough until now. This weekend I got to enjoy the 2009 New England SCBWI annual conference in a relatively relaxed and stress-free mode, providing tech support, AV support, and web support as needed. But they've hooked me as a co-director for 2010--how could I resist a technology theme? Now that the 2009 conference is nothing but a warm glow of good memories, I can officially start feeling anxious about next year. Actually it almost certainly won't be so bad as my old mentor made it out to be. 2010 will be the 24th annual New England regional conference, so there are systems firmly in place and a crowd of former directors to lean on as resources. And New England has a system by which an apprentice co-director is paired with an experienced co-director from the year before. Over the next year, between conference planning and my master's program, I will be blogging less about writing but expect me to blog more about the awesome conference I'm helping to put together. My word of the day is a-Twitter, a state of euphoria that you want to broadcast in 140 characters or less. Usage: When the Red Sox pulled out that 11th inning win against the Yankees last night, the fans were all a-Twitter. I don't really get Twitter. It seems like a pointless waste of time, and not the fun kind like spider solitaire that occasionally turns your screen into a fireworks display. But the hype has been crazy over the past couple months as news outlets have scrambled to sign on, then Stephen Colbert came up with an off-colored past-tense for the verb "to twit" that nearly knocked Meridith Viera out of her seat, and then over a million people decided they just had to cyberstalk that guy from "Dude, Where's My Car?" The conference is going great, by the way. This year I can relax and enjoy the workshops and festivities. Next year (May 14-16, 2010) I'll be co-directing so I expect very little in the way of relaxation. By then Twitter will probably be plugged directly into my brainstem, insideous as it is. Is it Earth Day already? It feels more like Groundhog's Day and I'm the one peeking out to see a shadow. I've been so swamped with things to do and not enough time to do it all. Monday was Patriots Day which is also Marathon Day here in the Boston area. We staked out a spot on Comm Ave across from Newton City Hall within earshot of the Poland Springs DJ. Poland Spring was pumping out the jams! We brought 'Xi, who had a great time running around and gathering last fall's leaves with another toddler she'd just met--that girl can make friends anywhere! We also brought Flat Stanley, from the Flat Stanley book series. With better planning we could have arranged to have Stanley carried along the route by a runner, but we probably wouldn't have gotten good pictures for his travel journal. Lots of great shots from the Boston Children's Museum yesterday, too. Flat Stanley flies back (via first class mail) to Florida on Friday. At the marathon ten years ago, I volunteered to hand out beverages and snacks to the runners after they crossed the finish line in Boston. It's inspiring to see so many people accomplish such a daunting goal. All that preparation. All that effort. All that sweat. And I was the one who got to say, "Congratulations, dude. Have a bottle of water and a bag of corn chips!" Writing a book is kind of like running a marathon sometimes. All that preparation. All that effort. All that sweat. And at the end, a bottle of water and a bag of chips! In 2010, I'm co-chairing the 24th annual New England SCBWI conference in (drumroll please) beautiful Fitchburg, Massachusetts! 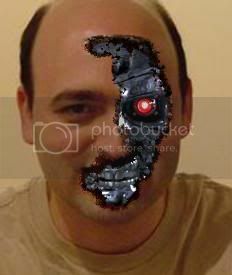 In 2012, I reveal myself as a cyborg sent back from the future to kill John Connor. I can't wait to see who gets cast to play me in the movie version. Thanks, TerminateYourself.com! Today's word of the day is subtext, which is an important writing tool as well as the reason those new Comcast commercials have been bugging the heck out of me. You know, the ones with the cartoony fantasy town where Comcast cable service makes everything magical. Notice that these fantasyland customers who are extolling their "happy high-tech automatic exponentially ecstatic" lives in Comcast Town all have unnaturally deadpan expressions and emotionless robotic voices. It makes us wonder, on a subconscious level, whether they've been drugged or hypnotized or both. The context is that everything is wonderful while the subtext is that these people have been assimilated into some kind of cult. As a result, while our conscious mind is admiring the scenery, our subconscious wants us to run away before we also become plastic-faced techno-zombies. Subtext is a double-edged sword for writing. When it's used purposely, it can be a powerful way to enhance a reader's experience without them even realizing what's going on. But when an unintended subtext undermines the intended meaning of an author's words, it can ruin an otherwise well-constructed story. Or commercial. Also, I happen to have the Comcast triple-pack and haven't noticed any singing squirrels, giant monster battles, or rooftop hot tubbing going on in my neighborhood. Just saying. Last week I did a book signing at our synagogue's Purim carnival culminating with a dramatic reading of an all-new Purim story I wrote for the event, and guess whose photo graced the local newspaper on Tuesday morning. Go on, guess! No, not me--my wife and daughter. It's probably because she's so much cuter and more photogenic than I am, and so is our daughter. Our 13-month-old prodigy loves walking around with a balloon in her hands and a handmade Queen Esther crown on her head, which apparently attracts newspaper photographers better than just some guy signing his own name in a book. She is also cutting her first molars, climbing her first stairs, and pronouncing her own name as "SEE". I'm spelling it 'Xi as the new Internet nickname she'll almost certainly one day grow to be embarrassed of. 'Xi loved the Purim carnival, and my Purim story was generally well received. It's the second in my Jewish Holidays series, which could be well on the way to becoming an entire book. I learned a lot about Purim in the process, including the kind of insights you never seem to have about a topic until you start writing about it. For instance, it turns out that Purim is probably the least religious holiday on the Jewish calendar. It commemorates a historical event that, unlike Hanukkah or Passover, does not require a miracle to resolve. Human courage and resourcefulness triumph over human greed and wickedness without the need for divine intervention. It's like God decided to take the day off, trusting that people would be able to solve their own problems for a change. Also, in my version of the story, there's a mutant alligator deathtrap. I even met up with an former co-worker who brought her children to the event. "We're not Jewish," she confided, "we just love a good carnival." And that's what we had--crafts, face painting, games, stories, food, prizes, and music--all the ingredients of a good carnival. 'Xi can't wait until next year! Actually, the inverse is true. Lots to do this week. Reproduced below is my latest post to the Spectacles group blog, which I recommend reading in it's natural habitat. I'm enjoying the group blog for the discussions being spun off and the ability it gives me to crack open a format that's wider than doing my usual "word of the day." For example, I can go off on a roughly drafted pseudo-angry pseudo-rant about a movie I haven't seen yet and just have a great time with it. Do Movie Critics Hate Authors? Because the marketing for the new movie Coraline plays down the Newbery-winning, Hugo-winning, Nebula-winning, Eisner-winning author who wrote the story, lazy critics across the country are assuming that only Tim Burton could combine dark themes with feature-length stop motion animation. Assuming to the point of printing their opinions on "Tim Burton's Coraline." One of my old Superguy buddies, Randy Milholland, imagines that Neil Gaiman isn't happy. He also imagines that Neil Gaiman has access to a sniper rifle. In the world of Randy's webcomic, "going postal" has been replaced with "going authorial." Update: Actually we don't have to imagine Neil Gaiman's reaction to such critics (or to the above webcomic) because Neil has a frequently-updated and incredibly popular blog. Neil isn't upset for himself, recognizing that the small credit he gets in the marketing material is already more than most authors receive. He's upset for the director, Henry Selick, for reasons going back to The Nightmare Before Christmas. A couple of days ago the front page at CBC (Canadian Broadcasting) website announced that it had interviews and reviews about Tim Burton's Coraline. Which I saw moments before I saw a piece on the Chicago Tribune print edition front page announcing its reviews of Tim Burton's Coraline. And my hackles started rising. Injustice and disrespect abound in movie credits, marketing materials, and reviews alike. Sixteen years ago Henry Selick got a raw deal that still overshadows his career on entirely unrelated projects, like Coraline. But I'm still outraged on behalf of Neil Gaiman and the larger majority of authors who get even less credit for their work. So I was already not impressed with the CBC website or the Chicago Tribune, and then someone sent me a link to an online newspaper in which the reviewer's first paragraph explained Tim Burton's career and then went on to explain, in an extremely dim sort of way, why Coraline was a Tim Burton film, and I twittered about it. And then watched the delighted twitterverse pile onto the poor gentleman in the comments page with surprise, realising that this power must only be used for good. I never thought I'd say this but... Hooray for Twitter! Today's word of the day is $8,539, the suggested retail price for the hardcover edition of R.R. Gupta et al's 463-page instant classic, Chemical Shifts and Coupling Constants for Silicon-29. The reviews are awesome, and at that price it'll earn out its advance in no time. Free Super Saver shipping is available through Amazon! Today's word of the day is: Bingo! My card was unlucky for the first few games, going deep into each session without a hit while other cards filled up with chips and went five-in-a-row. After each game we had a chance to trade in our cards for a new one, but I kept mine because I'm stubborn that way and had a feeling that it was due. Then, in the last game... Bingo! Grand prize! 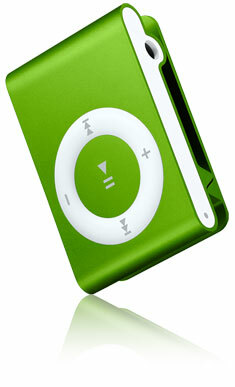 I've never had an iPod of my very own before. It's just a Shuffle, but at least I get to wear the white earbuds now like all the cool kids have. Yay, Bingo! Today's word of the day is: Project. It's not a book or a manuscript yet because most of it still only exists inside the author's head. "I'm working on a new project" sounds just as impressive as "I'm working on a new book" but also covers those times when "new project" is writerese for "new game of Minesweeper." My new project is a magical mystery book. We'll call it Project M for now. This week I was contacted through my agent by a book packager who read Penguins of Doom and thought my style would be perfect for this particular project. My audition is a sample opening that I'm working on over the weekend. If I get the job, that's exactly what it will be--a job. Work for hire. Bringing somebody else's characters to life and running them through somebody else's plot. But I don't mind because it's a fun story that plays to my writing strengths, and I'm sure I can make it an entertaining read. At the same time, my old project, Project G, is newly-revised and ready for submission to editors. This is the book that takes place over seven time zones and across the Solar System. I'm extremely pleased with how this book came out. It's been a long time coming and, as it turns out, a science fiction novel that takes place in 2011-ish is different from a book that takes place in 2007-ish. For one thing, I had a heck of a time writing around the fact that NASA is planning to decommission the space shuttle fleet, which was my main character's transport to a rendezvous in orbit. Also, I started writing Project G back when our Solar System had nine planets instead of just eight. Now every book referencing "Planet Pluto" is hopelessly dated and obsolete! 2009 is shaping up to be a promising year. Hopefully I will have good news to share very soon. Fingers crossed! Today's word of the day is Finally, an expression of relief after years of outrageous injustice. When I was growing up, Jim Rice was one of my all-time heroes. Rice played left field for the Boston Red Sox from my childhood through my teen years. He never played for any other team. Rice put up some totally sick numbers during his career, including a tremendous MVP year in 1978, when he powered the Sox to a regular-season tie for the AL East pennant (and we won't get into the result of that tie-breaker game right now, thank you). When I was twelve I made a complete fool of myself in an attempt to get his autograph. Meeting Jim Rice was the closest I've ever come to meeting Superman in person. Then Rice had the bad luck to retire just before the start of baseball's "steroid and growth hormone era." By the time Rice's name came up for Hall of Fame eligibility, guys with artificially pumped-up forearms were crushing previous records for hitters. Suddenly it no longer seemed as impressive to have 382 career homeruns, 2452 hits, 1451 RBIs, and 4129 total bases, all juice-free. So Rice was overlooked for the Hall of Fame. And again. And again. 14 years in a row. He could have "campaigned" for a spot in the Hall, because other players apparently do that. Votes are cast by a relatively small group of baseball writers, and it's entirely possible to plead your case to them all individually over the course of a year. But that's not how Jim Rice wanted to earn his place in history. He let his numbers speak for themselves, and for the past few years he's gotten more and more votes each time. These are votes cast by, substantially, the same small pool of BBWAA members, based on career numbers that do not change over time--so it's a big deal that the "experts" have been slowly changing their own minds in Rice's favor and coming to the same conclusion I did when I was 8. My childhood memories demand that Jim Rice should be a Hall of Famer. Finally, today, in his very last year of eligibility, Jim Rice was inducted into Baseball's Hall of Fame. I just have to ask, what took them so long? The word of the day is: Moving Fast. The M in Project M should stand for Moving Fast. I got the information for this series last week, spoke with an editor, and drafted an opening chapter over the weekend. I sent it in for comments on Monday and had a conference with the editor on Tuesday. Now I'm working from revision notes on another draft chapter for the end of the week. This is not what I'm used to. Usually I have an idea, start writing at a leisurely pace, and take a few weeks or a couple months before I show it to anyone at all. I'm insecure about openings. I spend a lot of time worrying that I'm off on a complete wrong track that nobody would ever want to read. And the part where I'm talking with an editor has always come long after the book is finished and completely revised two or three times. Not that I'm complaining. I'm getting into Project M and having a blast with it. This is still just an audition, by the way, but even if I'm not picked to write this series I've already learned a lot about writing for the mainstream markets. One of my strengths has always been writing quirky characters--the more quirks the better! I'm having to reign myself in with this project to make the main character more normal and easier for kids to identify with. There's still humor in the characters and the situations they get themselves into, but I'm having to work harder for it. I'm picking fruit from higher up in the tree and I think that will make me a better writer. I'm also not used to writing with an eye to what's marketable. On the one hand, I don't think anyone can ever tell what's going to be "the next big thing" that takes the world by storm. Who would have predicted that phonebook-sized middle-grade books about a British wizard school would sell as many copies as the "Harry Potter" series has? Nobody! And most of the books that were touted as "the next Harry Potter" haven't turned out very well at all. But on the other hand, editors have market knowledge and experience that can't be ignored. And the editors at a book packager are like uber-editors because their job is to put together projects that make ordinary editors salivate. My challenge will be working within those constraints and still ending up with a well-crafted book I can be proud of. Today's word of the day is: Audition, a process in which an eager applicant often makes a fool of him- or herself in public. There's a new "American Idol" season starting that I caught a few minutes of this week. The first few episodes of a season are the only ones that interest me because of all the desperate characters who come crawling out of the woodwork when the production visits their city. Some believe they can win a talent competition using questionable wardrobe decisions to distract the judges from their lack of singing ability. Others honestly believe they can sing but sound more like a rusty hinge than the next big pop star. Most entertaining are the ones who go off on the judges for being "wrong" or "jealous" of their obvious talent, all the while cursing and complaining as black-shirted security staffers pull them out of the audition room and dump them onto the street. Once the competition moves to Las Vegas, where the second stage takes place and all contestants have some level of actual ability, the show no longer holds my attention. That's why I can't name more than two previous winners. Let's see... There was a Kelly Whatsername who won one of the early seasons and put out an album or two and also a big guy named Rupert, or Rubin, or something like that. See? I told you I could do it. I've been thinking about my work on Project M as a type of audition as well, since I'm not under contract yet and might not actually get the job. I sent a revised first chapter and a brand new second chapter to the packager this morning. If they like it well enough, they will include my sample chapters in their series proposal to publishers--who will be free to say how much they'd love to print, market, and distribute millions of copies of these books if only some other author were writing them. This makes it a two-stage audition where I have to win both parts of the competition or go home. Metaphorically. Since I'm already home. You know what I mean. The prize would be a wicked cool writing gig on a project that's already singing to my brain. In order to write these two chapters I had to think ahead to chapters to come and set up plot and character arcs leading to a dramatic conclusion that right now only exists in my head. So if I don't get the contract, believe me, I'm taking my dramatic conclusion and cursing the Simon Cowells of the publishing industry to the cameras on my way out of the arena. See you in Vegas, baby! Random observation: Speaking of music, the radio stations around here suddenly increased the amount of 90's music they play, starting on or around January 1st. Did somebody officially decide that 2009 would be the year when we're all ready to hear Nirvana, Soundgarden, and Pearl Jam again? Today's word of the day is: Inauguration, a new beginning. I'd be there in person, if I could, if there were room for another person to stand anywhere on the Mall. But from what I can see on CNN, the entire city of Washington D.C. looks to be as crowded as a rush-hour subway train. This is the most amazing day in the life of our democratic system. Today one President willingly gives up power to another. Think about that for a moment. George W. Bush has spent eight years getting comfortable with being Commander in Chief of the most powerful military force in history, about a dozen intelligence agencies (that we know of), the planet's wealthiest central bank, embassies and offices around the world, and a small army of bureaucrats and federal workers. Oh yeah, and he's also keeper of the launch codes to a nuclear arsenal that could kick-start Armageddon with the press of a button. Can you imagine how difficult must it be to step aside from all that power, privilege, and prestige? And how humbling it must be to stand on the other side of the lectern, to be the man inheriting the office with a few words and a hand on Abe Lincoln's old bible? With the daunting problems facing our country and our world, and with all the expectations people have for him, it must be a struggle for Barack Obama to fight the urge to run away and hide. I'd run away and hide, if it were me, and they wouldn't find me until my four years were up. The fact that a smooth transition of presidential power can ever occur is a genuine miracle. And as a bonus, we get all the history embodied by the election of Barack Obama. A mere 146 years after the Emancipation Proclamation, just six generations after the abolition of slavery, the voters of America have elected a president who is only 50% Caucasian. We have come so far so fast! Okay, I lied. It's actually a painful embarrassment how long it's taken to get to where we are, how much farther we have to go, and how much our societal advancement has been impeded by knuckle-dragging yahoos who refuse to acknowledge that nobody is better than anybody else just because of their skin color, gender, religion, sexual orientation, or cultural identity. But today is a big step forward that we can all be proud about. It's a day I've been looking forward to for eight long years, in one way, and my entire life in another way. Today's word of the day is Spectacle, which is something worth viewing, as opposed to spectacles, which are something to view a spectacle through. I was psyched that Neil Gaiman won the Newbery Medal for Books About Motherless Protagonists (don't get me started) and that Terry Pratchett and M.T. Anderson both had Printz Honor Books--which makes three award-winning books from three of my all-time favorite authors that I'll need to bump to the top of my "must read" list. Elizabeth Bunce, a member of the Class of 2k8 group, won a William C. Morris Award for debut authors--exciting because we in the Class of 2k7 have been watching her and the other Class of 2k8ers all year and now the Class of 2k9ers as well. Here in New England we're proud of New Hampshire's Beth Krommes for winning the Caldecott Medal and Maine's Melissa Sweet for her Caldecott Honor Book. Also Floyd Cooper, who won the illustrator's Coretta Scott King Award, will be a keynote speaker at this year's New England SCBWI conference while Laurie Halse Anderson, who won a lifetime achievement award, was a keynoter at last year's conference--showing the quality of our conference faculty, in case anyone had any doubts. Aside from the spectacle of the ALA Awards, I've written my first article for the all-new group blog, The Spectacle, featuring authors of speculative fiction for teens and pre-teens. In addition to myself we so far have Parker Peevyhouse (Last Midnight, et al. ), P.J. Hoover (The Forgotten Worlds series), and Jo Whittemore (The Silverskin Legacy series). It's exciting to be part of such a great group of blogging authors! My first entry is "Does Hollywood Hate Authors?" where I get to vent a bit about the ad campaign for Coraline. I'm hoping Neil Gaiman’s Newbery Medal win will soon be reflected in the advertising for the new Coraline movie. The book was creepy and cool, chock full of idea hooks, fun characters, and plot surprises–just what we’ve come to expect from Gaiman's work. But for some reason the studio’s marketing department thought more viewers would be drawn to "a film directed by Henry Selick" than "a story written by Neil Gaiman." Attention Hollywood: If an author of Neil Gaiman's caliber is in any way connected to your movie, you will sell more tickets by including his name in your ads!